Tega and her family of 4 daughters are a family we have helped on several occasions, two of her daughters are in work. One works as a labourer and the other, Feleg, is training to be a teacher at the Day Care Centre. In September she will be starting a one years course at a teacher training centre, which we agreed to fund. Once fully qualified she will be offered a full time place at the Day Care Centre. This will be a wonderful achievement considering her background. Balatu, Tega’s youngest daughter aged seven is now back home following an operation to correct her webbed fingers. She missed some school but hopefully with her new found confidence she will soon catch up. Tega’s oldest daughter Truye has a small hut next to the main house, the hut desperately needed repairs to the roof which we agreed to fund, and Truye will get this done before the rains come at the end of May. This is a family that exists from day to day, clothes that we gave them last year are still being worn today, emphasis on the word worn! But every time we see them the greeting is always the same, they offer us food and coffee, and as with most Ethiopians they have very little but are always willing to share what they have. Tega’s health has not improved greatly from last year, she has had a serious fall and she also continues to have stomach problems. We will continue to support this family, supplement them with food in the hope that Tega’s health will improve. Cost of 3500bir or £130. It did not take us long to agree that this was a cause worth funding. Zewede did not hesitate to get her booked in and she is due to go to the hospital in a couple of weeks. We have known Gashow for many years, badly disabled from polio as a child he has always walked clinging to a large stick with his disabled leg sticking out from the knee. Last year we did not see Gashow or his smiling face as Sister Terfatu had arranged for him to have an operation on his leg via the Cheshire Foundation. This year we saw a young man resembling Gashow walking with two sticks coming towards us across the field; it was not until he was close that we recognized the smile and the fact that this young man walking very upright was indeed Gashow. In time he will only require a single cane to walk with. Gashow is still working with his sewing machine and tells us he has plenty of work. He is no longer attending school, as he has to work longer to support his thirteen year old half sister, Bethlehem, who now lives with him in rented accommodation, having been sent away from her family home as her parents are no longer willing to look after her, a huge responsibility for a young man to take on. We will continue to support Gashow as and when required. We have mentioned Ethune in previous newsletters. Last year she was in rented accommodation. Pleased to say that she has a house in the New Jerusalem (see Housing). She lives with her son and daughter and a cute little puppy (full of fleas). 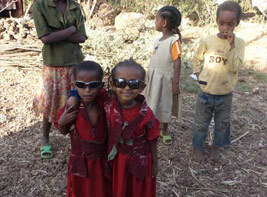 Both the children attend the state school and Ethune is cooking and selling Injera to support them all. She was pleased to see us and show us her new house and the picture she had of her and Angie on the wall. Due to the increasing price of Tef needed to make Injera we agreed with Sister Terfatu to leave her £9.50 per month to help towards the rising costs so that she can continue to work and support her family. Sister Aylech bought these poor souls to our attention. Deshan is thirteen years old and Emmanuel is nine. Both their parents have died due to Aids and are now living on their own. Sister Aylech has managed to find a house in the New Jerusalem for them and we have agreed to help support them with a monthly allowance to go towards the cost of food.